"To you it's just a test — a gauntlet to be run"
After Fenton's fitful and feverish night of sleep, Charles — desperate both to treat him and to see Fenton's precious notebooks — fetches water from the river. Description: The weir is a noisy and spectacular sight at any time of year. The stone platform on which Charles (and the camera crew) stood is accessible down a short, steep mud path, and is an excellent position from which to take photos. However, the area submerges when the water level rises. Where is it? 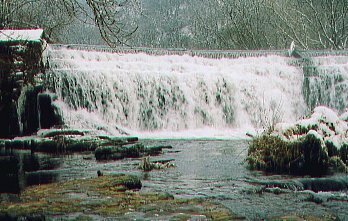 : The weir is in the heart of the Monsal valley, about 5-10 minutes walk from the base of the viaduct along the bank of the river. Where's the best vantage point? : The stone platform (see above) is a good viewing position, but the weir looks fantastic from all angles. To view the weir from the other bank, walk further away from the viaduct a short distance to a small bridge, cross to the other bank, and return along the far side. What about access? : Access is free and unlimited. There are no restrictions on photography. Anything else? : The top of the weir is seen later on in the episode when Sanders, Jim and Charles flee to the safety of the waterside from the now plainly-rabid Fenton. 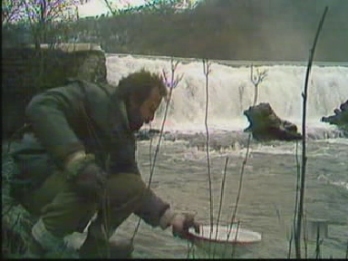 Although, in the programme, the weir appears to be in the valley below Fenton's half-way house, the two locations are many miles apart.